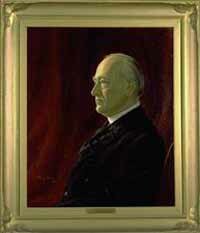 Charles A. Blair was born on April 10, 1854, in Jackson, Michigan. His father was Austin Blair, the famous “(Civil) War Governor” of Michigan. Blair graduated from Jackson High School in 1872, and from the Literary Department of the University of Michigan in 1876. He studied law in his father’s office, and was admitted to practice on September 5, 1878. He was Prosecuting Attorney of Jackson County, besides holding several minor offices. He was married in 1879, to Miss Effie C. North. Blair was elected to the office of Attorney General in 1902, and was the unanimous choice of the Republican State Convention for the second term nomination to that office. Blair’s name was placed before the Judicial Convention in 1904 as a candidate for Justice of the Michigan Supreme Court, and he was nominated for the five-year term. He withdrew his name as a candidate for Attorney General, and was elected to the Michigan Supreme Court. Charles A. Blair died in his Lansing home on August 30, 1912.